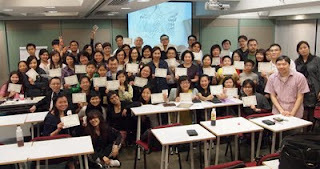 In our most recent newsletter, we showed a picture of Fina Man, CZT, and her first Zentangle class in Hong Kong. Recently, Fina sent us some more pictures and stories that we're thrilled to share with you. 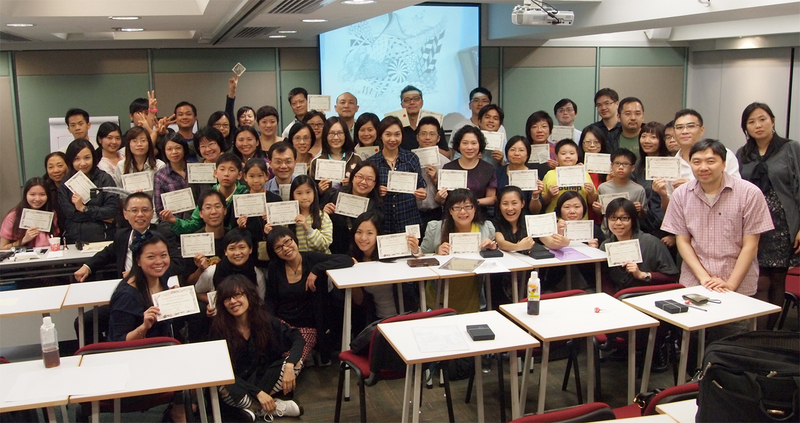 The first ever Zentangle workshop was held in Hong Kong in May 2011. There were two 2-hours sessions with more than 50 people who participated for this workshop. 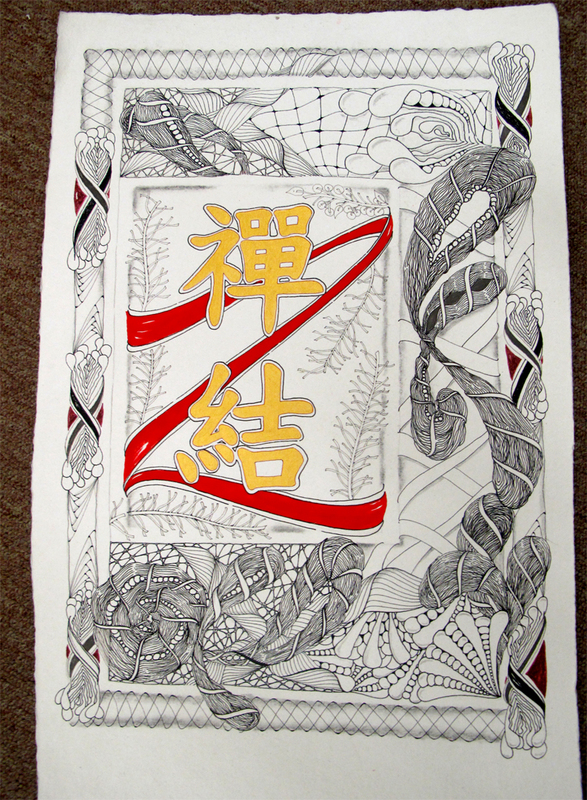 Keith, my colleague and our first Zentangle artist in Hong Kong and in Asia, had helped me to design this "Tangling to Un-Tangle Program" from which the Zentangle forms the core of this program. 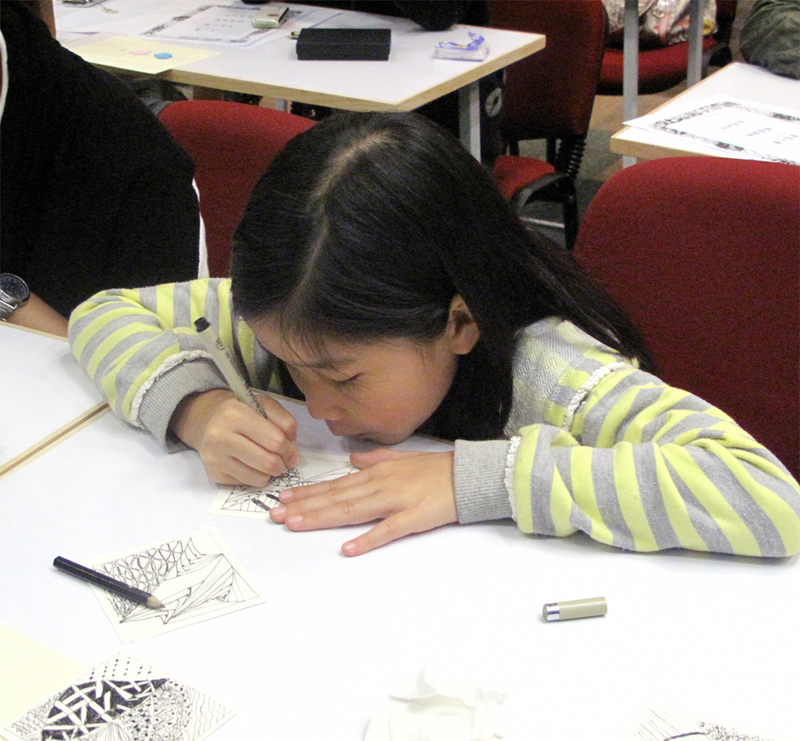 We want the participants to have an in-depth understanding of Zentangle, therefore, the story of Zentangle, Maria and Rick, the relevant theories, benefits, tangling were included as main framework for this workshop. It was an amazing event considering the limited 4 hours session overall, but everybody have enjoyed this wholesome experience. Two years ago. 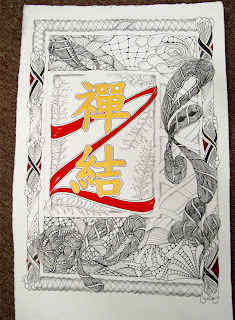 Maria had asked me to come up with a Chinese name for Zentangle. As a result, Keith and I come up the name of "禪結". This is from the direct translation whereby 禪 means Zen, and 結 means knot. We create knots on our minds and in our lives. It is our own selves who created our tangles, so we are able to understand them and we can untangle them. By the way, the Chinese character of 結 means knitting of fortune and good luck. 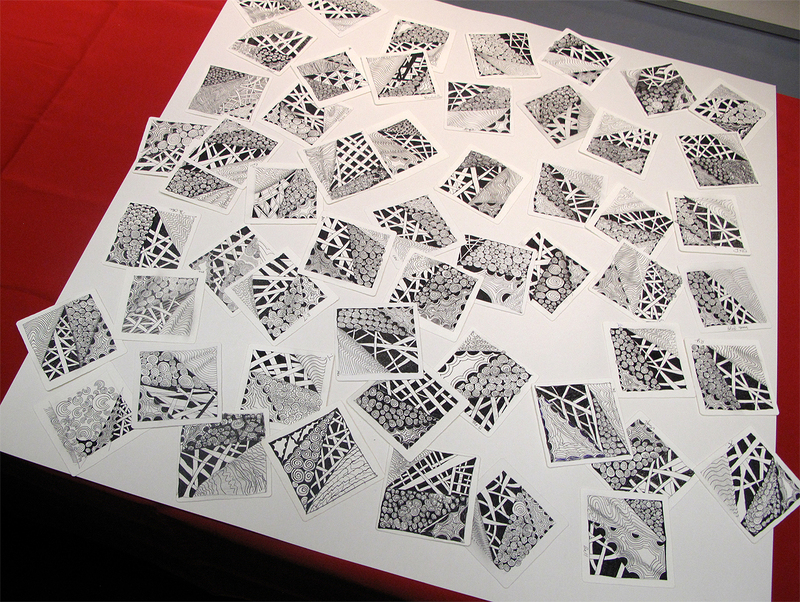 Yes, every piece of Zentangle is a symbol of luck and fortune as Zentangle is actually the road to understanding our knots and ourselves within. Here are some more pictures from Fina's class. That's Fina sitting on the floor with her arm on the table, third from the left in the front row. Fina attended our very first CZT seminar and came back to attend our first Zentangle Master Class. Fina is a wonderful person who has become a good friend. Congratulations, Fina, and thank you for sharing those pictures with us. Also, our gratitude to you and Kieth for translating 禪結. WOW. What beauty and excitement! I love the part about creating knots in our minds/lives and untangling them. 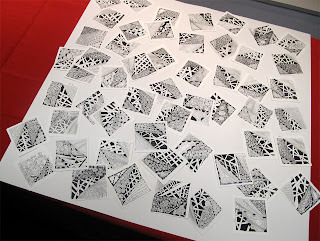 This is the potential of Zentangle!! I love the red Z and all the lovelies surrounding it. A flower has opened in Hong Kong! Thank you, FIna and Zentangle! This was a delight to read! Having lived in mainland China for two years and being unable to read Chinese, I'd love it if Fina could provide the pinyin (with accents) for 禪結 - I want to know how to pronounce it! I resonated with Fina's idea about the knots. My research on string figures found that in Hawai'i there was an old healing practice of tying and untying knots. I often find myself doing just that when I use the Zentangle process with healing intent. 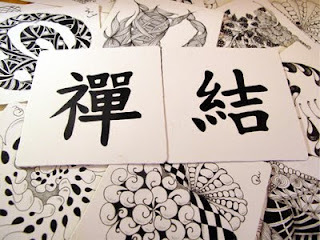 The Chinese Mandarin pinyin (pronunciation) for 禪結 is chán jié.